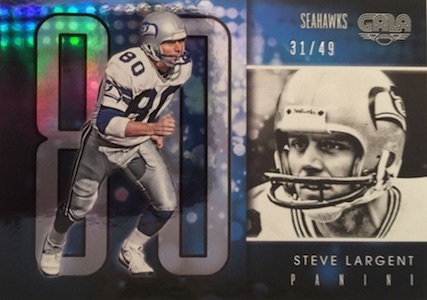 Largely mirroring the look and format of the basketball edition, 2016 Panini Gala Football moves the focus to the NFL. Each hobby box includes four total hits that are all numbered to 99 or less. 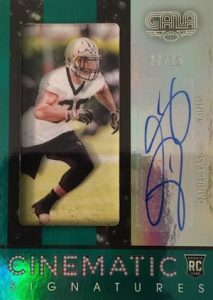 Just like the basketball set made waves with incredibly limited rookie cards in the base set, 2016 Panini Gala Football duplicates that effort as top 2016 NFL rookies are treated to a print run of just eight copies. There is also a primary base set with veteran players (#/49) that average one per box. 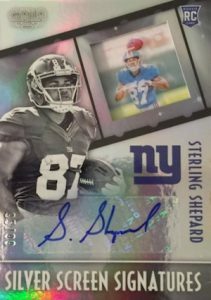 Sticking to the headline theme that takes inspiration from the big screen, on-card autographs are heavily featured in 2016 Panini Gala Football. Cinematic Signatures and Silver Screen Signatures both utilize a film-strip design with parallels as low as one-of-one. Showcasing both veterans and retired players, other signed inserts include Action Autographs, with an exciting image, Starring Roles Signatures, and Vintage Performers Signatures, complete with a faded look. All three feature a vertical layout. Base cards (#1-145) - #/49, Rookie cards (#146-200) - #/8. PARALLEL CARDS: Jade #/10 (Card #1 - #/25), Crimson #/5, Midnight 1/1..
*Cards #5 and #17 not found in Jade parallel. 49 cards. Serial Numbered #/99. PARALLEL CARDS: Jade #/25, Crimson #/5, Midnight 1/1. PARALLEL CARDS: Jade #/25 or #/10*, Crimson #/5 (No card #46), Midnight 1/1. All subjects not found in Jade parallels. View specific options with the full spreadsheet. 20 cards. Serial Numbered #/49. PARALLEL CARDS: Jade #/25, Crimson #/10, Midnight 1/1. PARALLEL CARDS: Jade #/25 or #/10, Crimson #/10 or #/5, Midnight 1/1. PARALLEL CARDS: Jade #/25 or #/10, Crimson #/10 or less, Midnight 1/1. 47 cards. Serial Numbered #/99. PARALLEL CARDS: Jade #/25 or #/10*, Crimson #/5, Midnight 1/1. All subjects not found in Jade parallel. View specific options with the full spreadsheet. PARALLEL CARDS: Jade #/10*, Crimson #/5, Midnight 1/1. Many subjects not found in Jade parallel. View specific options with the full spreadsheet. 10 cards. Serial Numbered #/49. 29 cards. Serial Numbered #/10. PARALLEL CARDS: Crimson #/5, Midnight 1/1. LOL looks like pop century football version. For $$$$$$$$$$$. Just more of the same from Topps and Panani. 2016 Panini GALA FOOTBALL Hobby Box - GOFF RCs!